You can’t please everyone, so just how important are the views of a small number of residents compared to the potential benefits to other road users? This evening I was at one of two consultation meetings about the proposed changes to Histon Road and it looks like there will be the usual divide between local residents opposing any change and those using the area. The proposals are fairly unexciting: to make a small improvement to bus reliability parking bays will be removed to be replaced by narrow cycle lanes so that buses and cycles can pass. According to bus operators and Bob Menzies (senior executive at Cambridgeshire County Council) buses get stuck behind cycles on this busy route into the city. About £40,000 is available for the scheme with some money from the national Better Bus Areas fund and some to improve cycle safety at the Gilbert Road/Histon Road junction. With only £40,000 available this is mainly a paint and signs scheme plus some traffic signal timing changes but the key part is the removal of parking to provide more space. 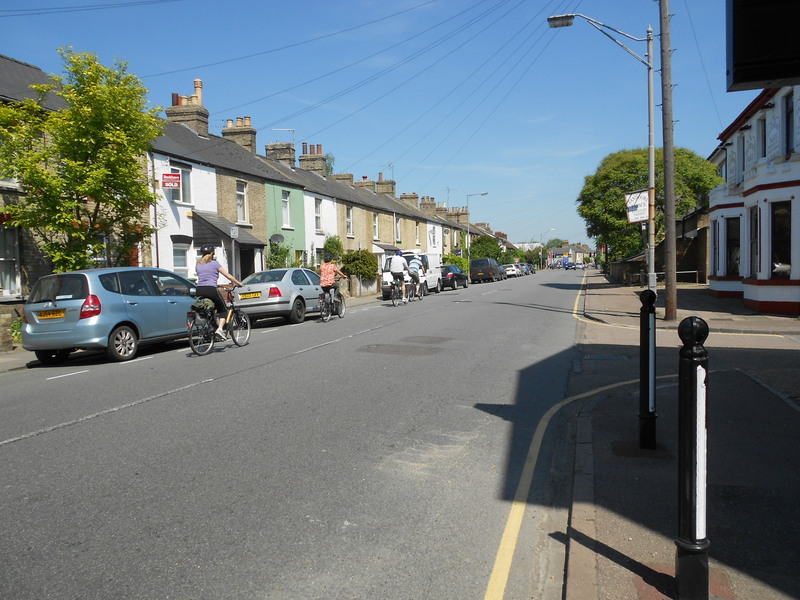 Parking on Histon Road via CycleStreets. 35 residents’ parking spaces will be removed and this should improve the traffic flow for the 21,000 vehicles, 200 buses/coaches and uncounted cycles that use this road every day (figures for 2011 from Cambridgeshire County Council). Displaced residents’ cars will go to the Canterbury Street area, which is less subscribed than other parking areas in the city, but not by any means empty. Traffic flow is not an end in itself and a clear road could increase traffic speeds which could lead to more collisions or more serious injuries. It is hoped that the cycle lane markings will visually narrow the road and encourage good behaviour. In essence the vehicles parked on the highway are causing an obstruction. There is no right, in law, to park vehicles on the highway although it is accepted practice these days. So on one hand we have the residents who live on a main road and will be very vocal. On the other hand we have the many more people using the highway for its intended purpose who may not even know about the proposals. If you use this route you should speak up. This is where we need strategic thinking from the councillors who will make the decision on this scheme. You can’t please everyone but you can please the thousands on the highway.